Steve is a great instructor and made learning to drive really comfortable, this put me at ease and gave me the confidence to pass. I couldn't have wished for a better instructor and I am sure I wouldn't of passed if it wasn't you that taught me. I really enjoyed the whole driving experience with Steve. He was extremely patient, very helpful and an all round great guy! Steve has been a great instructor to learn with. He has been very patient and reassuring, and has been good to learn to drive with. I was feeling quite nervous at the start,however as the lesson carried on I felt more at ease. 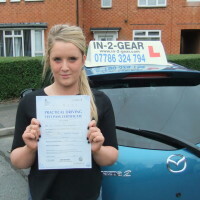 I feltlike I had learnt a lot on my first lesson with Steve, and since then my driving skills have progressed. I now feel more confident behind the wheel. Before I started my first lesson I was nervous thinking I wouldn’t be able to remember anything, let alone drive the car!